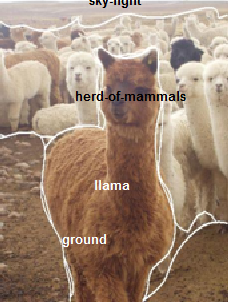 Each image has been manually segmented and the resultant regions have been annotated according to a predefined vocabulary of labels; the vocabulary is organized according to a hierarchy of concepts. 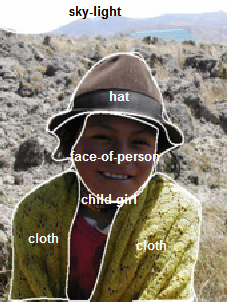 Visual features have been extracted from each region. The SAIAPR TC-12 Benchmark is now publicly available. Information on how to access (and download) the complete benchmark is given below, while Section 4 provides links to related publications. Segmentation masks.. One per region: 99,535 files; one per image: 20,000 files. Each object of reasonable size is segmented by using ISATOOL. 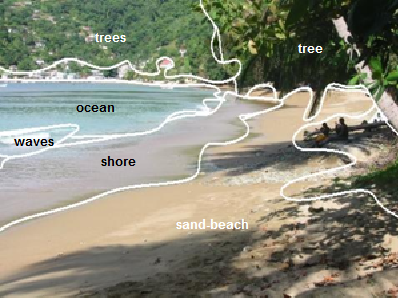 In average 5 objects per image have been segmented. 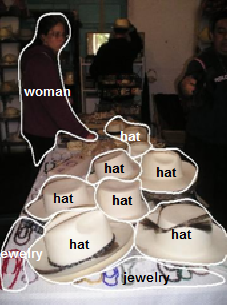 The average area of such objects is of ~16% of the total of their respective image. The resultant segmented images are provided as well. Annotations. One per region: 99,535 regions were manually annotated. 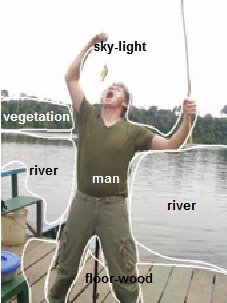 Each segmented region is assigned a label from a carefully defined vocabulary, see ; the annotation vocabulary has been organized according to a conceptual hierarchy. For annotation the annotator went through the hierarchy from top to bottom looking for the best label for each object. Spatial relationships. One per image: 20,000 files. The following relationships have been calculated for each pair of regions in every image: adjacent, disjoint, beside, X-aligned, above, below and Y-aligned. Visual features. A vector of features per region: 99,535 vectors of attributes. The following features have been extracted from each region: area, boundary/area, width and height of the region, average and standard deviation in x and y, convexity, average, standard deviation and skewness in both color spaces RGB and CIE-Lab. To annotate segmented regions in SAIAPR-TC12 a hierarchical organization for the annotation vocabulary was defined. According to this hierarchy an object can lie into one of six main branches: Humans, Animals, Food, Landscape-Nature, Man-made and Other . Here is the branch Humans (click in the respective names to visualize the corresponding branches). unpack the first part-file saiaprtc12ok.part1.rar using winrar® or your preferred software. The Segmented and Annotated IAPR TC-12 Benchmark.. Escalante, H. J., Hernández, C., Gonzalez, J.., López, A., Montes, M., Morales, E., Sucar, E., , L., Grubinger, M.. Computer Vision and Image Understanding, doi:10.1016/j.cviu.2009.03.008, 2009. Escalante, H. J., Hernández, C., Gonzalez, J.., López, A., Montes, M., Morales, E., Sucar, E., , L., Grubinger, M.: The Segmented and Annotated IAPR TC-12 Benchmark. 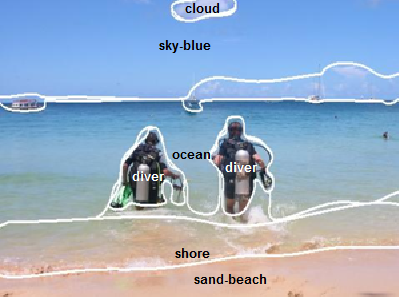 Computer Vision and Image Understanding, doi:10.1016/j.cviu.2009.03.008, 2009. Clement H.C. Leung, Horace Ip: Benchmarking for Content Based Visual Information Search. Proceedings of the Fourth International Conference on Visual Information Systems (VISUAL'2000), number 1929 in Lecture Notes in Computer Science, pages 442 - 456, Lyon, France. Springer Verlag. Michael Grubinger. "Analysis and Evaluation of Visual Information Systems Performance". PhD Thesis. School of Computer Science and Mathematics Faculty of Health, Engineering and Science Victoria University, Melbourne, Australia, 2007. Michael Grubinger, Paul D. Clough, Henning Müller, Thomas Deselaers: The IAPR TC-12 Benchmark - A New Evaluation Resource for Visual Information Systems. Proceedings of the International Workshop OntoImage'2006 Language Resources for Content-Based Image Retrieval, held in conjunction with LREC'06, pages 13 - 23, Genoa, Italy, May 2006. Hugo Jair Escalante, Manuel Montes, L. Enrique Sucar, Michael Grubinger: Towards a Region-Level Automatic Image Annotation Benchmark. Proceedings of the Third Workshop on Image and Video Retrieval Evaluation, pages 64-73, Budapest, Hungary, 2007. We are very grateful with Thomas Deselaers for his support on the storage and management of the data. National Institute of Astrophysics, Optics and Electronics, Luis Enrique Erro # 1, Puebla, 72840, Mexico.